Bramley Carpets supplies the highest quality carpets throughout Stockport and the North West. Our range of carpets are available for both domestic and commercial requirements, so we have an extensive selection of different products from some of the most renowned carpet manufacturers here in the UK and around the world. In store we work closely with all our clients to help choose the right carpet for your needs whilst aiming to bring out the best of your interior, not only do we offer friendly and helpful advice in store but we have a take away sample service so you can see the carpet at your property as well as a free measuring and estimation service. At Bramley Carpets, not only are our sales advisers friendly and professional but so are our team of installers. Our team of intallers are highly experienced, qualified and dedicated people who have fitted carpets of all shapes and sizes in countless properties for many years. Whether you've got a Hallway that needs livening up or a Staircase that's desperate to be finished in style, Carpet Runners are the perfect solution. 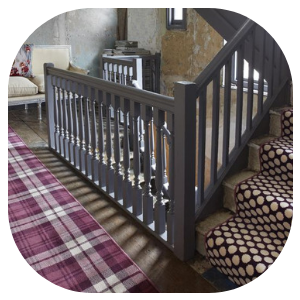 This ever popular choice can preserve existing floors, bring a decor to life and will certainly add that touch of class when used as a Stair Runner. 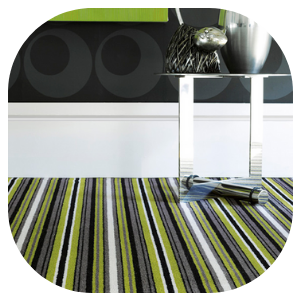 Most Carpet Runners are bespoke made so can be sized and finished to suit your needs, at Bramley Carpets we have endless colours, textures and designs available such as Stripes, Tartans and Pin Dots from some of the leading manufacturers like Alternative Flooring, Kersaint Cobb and Ulster Carpets.. Specifically designed for stair runners, Stair Rods are also a popular choice when looking for a distinctive classical look and we offer various designs and colours to finish a staircase with an elegant look. For a top quality carpet, it doesn't come better than Wool, Wool is a soft, durable and natural material that's perfect for carpeting any home. The density and resilience of Wool carpet is second to none making it perfect for use as a stair, lounge or bedroom carpet. At Bramley Carpets we offer an extensive range of 100% and 80/20 Wool Carpets from a majority of leading manufacturers such as Adam Carpets, Crucial Trading, Hugh Mackay and Westex Carpets. Natural- Wool grows on Sheep who graze freely so is 100% natural and fully sustainable. 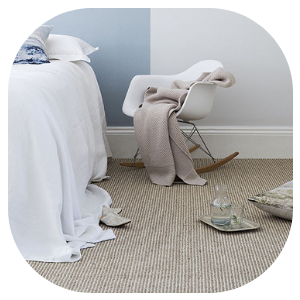 Comfort- There's nothing more satisfying than a soft, comfortable and warm carpet under your feet, Wool offers just that. Easy Care- Wool has natural water-repellent properties so spillages will pool for longer, plus less static electricity helps with detracting dirt stains. Insulation- A great heat insulator, Wool will keep your home warm in the winter months helping reduce the cost of energy bills. Durability- Natural fibres make Wool Carpets extremely strong and durable meaning they will typically keep their appearance longer that man made synthetic Carpets. Hypo-Allergenic- Wool is non-allergenic and does not promote the growth of bacteria or dust-mites. Every home is different but if you feel like you'll be cleaning your carpet on one too many occasions, possibly from children or pets, then a Man made Carpet may just be the perfect option for you. Man made Carpets are not only but Durable, Stain Resistant and incredibly Easy To Clean, they are also cost-effective in comparison to premium Wool Carpets. At Bramley Carpets we offer a variety of Polypropylene, Polyester and Nylon Carpets in various colours, designs and styles from some of the most renowned manufacturers such as Adingdon, Cormar Carpets, Lano and Telenzo, so whether you're looking for a extra thick Bedroom Carpet or a super stylish Striped Carpet for your stairs, at Bramleys we have everything covered.